With an unexpected, unplanned day ahead of us due to bad weather at the Tongariro Crossing (see earlier post), we discussed our options with our B&B hosts Peter and Grace who enthusiastically informed us of nearby Waimangu Volcanic Valley located near Rotorua. 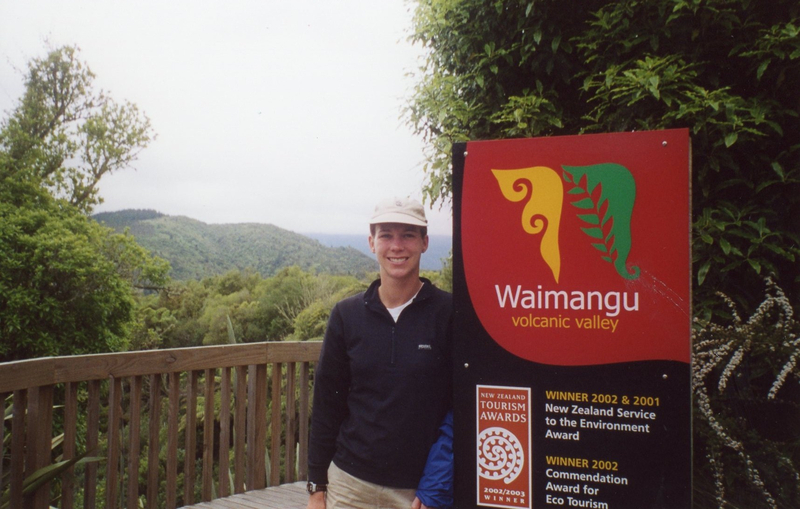 The world’s youngest geothermal system and the “must-do” tourist attraction in the area, Waimangu Volcanic Rift Valley is definitely a thrill to see. There are tons of tour agents offering daily visits to the area but of course Paul and I wanted to do it on our own and chose the best way to see the area: A hike. 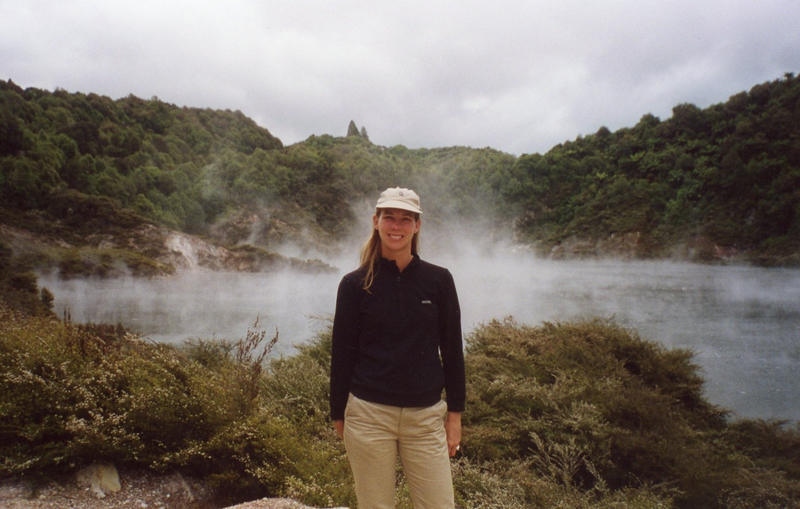 We drove first to the town of Rotorua, whose abundant thermal activity makes the entire place smell like rotten eggs! (Perhaps you get used to it when you live there!). The town was way too touristy for my liking yet it was indeed fascinating. Our stay was short, however, as we wanted to get a hike in and knew that most of the tourists would not be following us. We followed the trailhead for a short hour and a half hike up and back. There was not a soul around, the way I like to hike and the views were impressive. Hot steamy water. Wouldn’t want t take a swim in there! Interesting greenery given the location! 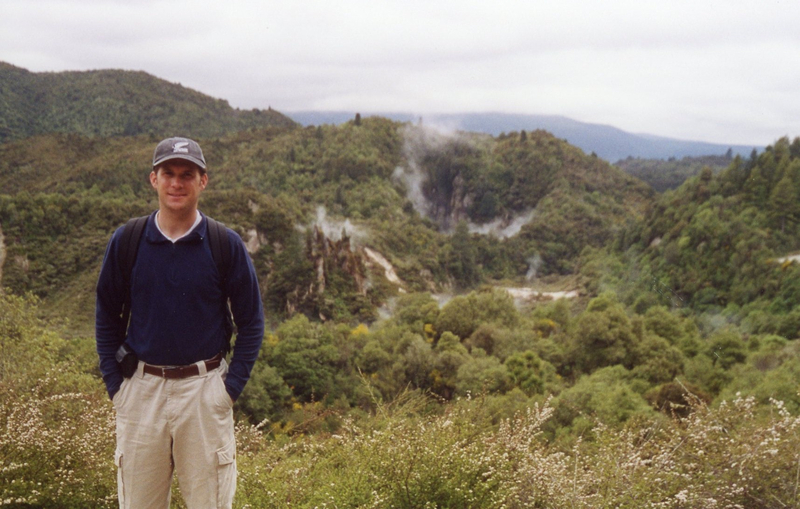 View at the top of the Waimangu Volcanic Valley. The park proved to be a great day hike. It was my first visit to a geothermal valley and I was amazed by the lava lakes, hot volcanic streams and the unique curiosities the place. As the afternoon skies began to clear we wished we had one more day in the area to do the Tongariro Crossing. That night we saw it, finally, while we were eating dinner at a restaurant in Taupo. We took a sip of our cold beer and thought…next time. 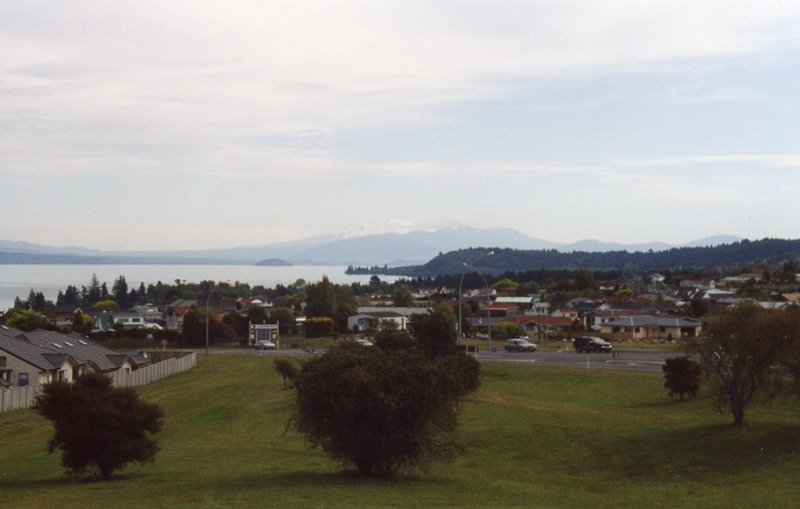 Here it is, the Tongariro Crossing in the background. What a lovely place. Can’t wait to hear about your adventures in Guatemala. Hope you are enjoying your weekend. There are quite a few volcanoes in Guatemala. We hiked to the top of Pacaya in 2009 and then in 2010 it erupted. I wish I had time to do one but not sure since I’ll be mostly taking spanish and volunteering. As you probably can tell, I love to hike! Especially mountains and volcanoes! My sister lives on a farm not far from Rotorua – our boys call it Rotten-rua and tease each other no-end when they are anywhere near it! 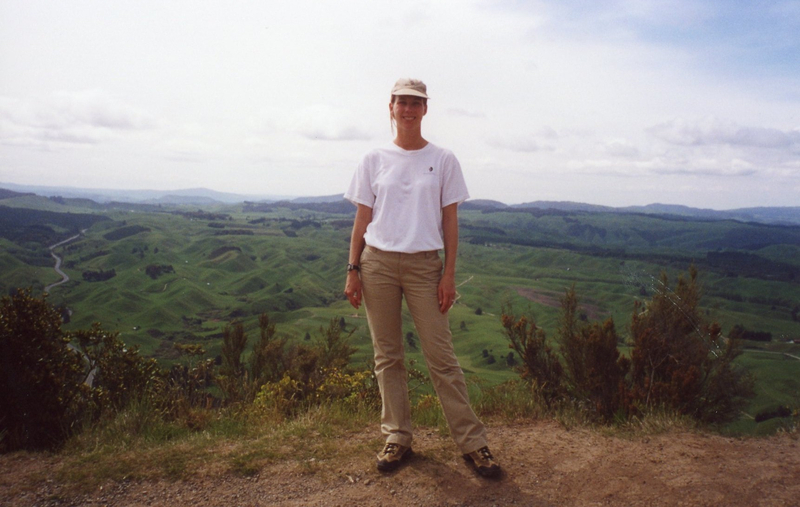 I hated visting Rotorua when the boys were toddlers – they were all great climbers and even the fences around the boiling mud (in town) wouldn’t have kept them out. That is hilarious! I never thought of the dangers before with the boiling mud. I can only imagine that was just another worry for parents!